Limousine bus is the most convenient and inexpensive way to get to Hoam faculty house from Incheon International Airport. 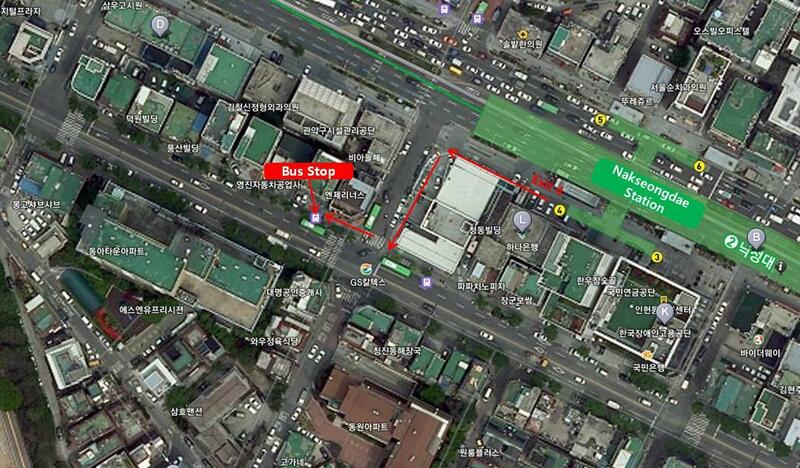 Take the airport limousine bus 6017 at Bus stop 6B and get off at the final stop just in front of Hoam Faculty House. If you take a taxi, please show this direction to Taxi driver. Take the airport limousine bus 6020 at Bus stop 5A or 11B and get off at the Jinhung APT (PROVISTA HOTEL). 2. Get off at Nakseongdae and follow Exit #4. 3. Take a town bus #2 in front of Jean Boulangerie Bakery just across from GS gas station toward Seoul National University campus via rear gate (shuttle bus interval is 3-5 minutes). Get off in front of Hoam Faculty House. Limousine bus is a convenient and inexpensive way to get to SNU Gwanak Campus from Incheon International Airport. Take airport limousine bus number 6003 via Gimpo Airport and get off in front of the Main Gate of SNU. Bus fare is 9,000 won and it takes about 80 minutes under normal traffic conditions. Service is available everyday from 5 am to 8 pm at Incheon International Airport with no charge for the baggage. A Call-van is called "Jumbo Taxi" here and service can hold up to 5 passengers and up to one ton of baggage. Fares are about 65,000 won from Incheon Airport to SNU. For reservations, please call 1644-1236 or 1423 (domestically) or +82-70-8237-8200 (from overseas). After exiting exit no.3, walk towards the Gwanak-gu Office. There you will find the school shuttle bus and also a regular bus that comes to SNU. The campus shuttles are free of charge. The operation and interval of the buses differ during vacation time and semesters, but is usually in the range of every 5 to 20 minutes. Buses number 5511 and 5513 circulate the campus counter-clockwise, from the main entrance towards the Administration Building.